Hello, Sam here with JBugs.com. A few weeks ago I had to tow a coworkers 1967 Beetle. He came around a corner on his way to work and the engine suddenly started revving, but the car wasn't moving. The transmission was in gear so he suspected that perhaps the clutch or transmission went bad. I had a different feeling so I asked him for the keys and told him to watch the axle nuts on either side of the car. I started the car and put into gear and slowly let out the clutch. Sure enough the left side axle was spinning, but as you can see the car wasn't going anywhere. So I loosened the lug bolts, pulled the axle nut cotter pin, and removed the axle nut, which was finger tight. I jacked up the car, set it on a stand, removed the four lug bolts that were there Pulled off the wheel, and then slid off the drum. The splines inside the drum were nearly completely gone and there were fine metal shavings inside the drum and on the backing plate. A few things can cause a spun drum. The most common reasons is [are] the axle nut wasn't torqued tight enough or the axle spacers have worn out and allowed the drum to loosen up. I grabbed the new brake drum and a new set of lug bolts, so we'd have a set of five, and I slid the new drum in place followed by the axle nut, the wheel, and the lug bolts. I lowered the Beetle off the jack stands and set it back on all four wheels and then I tightened all the lug bolts. I tried to tighten the axle nut, [but I] discovered the threads were missing, so I replaced it with a new axle nut. Most importantly I tightened it to the two hundred and seventeen foot pounds of force needed using my weight and a breaker bar. With the axle nut torqued the new cotter pin was slid in place and the ends were bent into place and it was time to check the repair. Sure enough! With the car in gear the Beetle now moved as it should. This video isn't meant to be so much as a tech tip but as a reminder. Make sure your rear axle nuts are extremely tight and perhaps as maybe a helpful diagnosis if you happen to be driving your VW, and suddenly you're going nowhere. 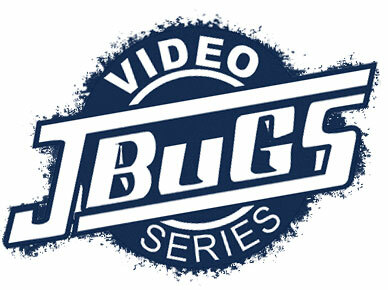 Thanks for watching and stop by JBugs.com for all your vintage VW needs.